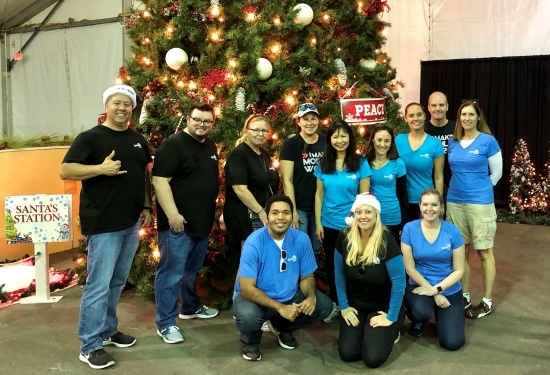 On Dec. 15, for the sixth year in a row, members from the Marketing, Corporate Relations, Strategy and IT departments at our Tampa office helped distribute food, toys, and other items to needy families at a special tent run by Metropolitan Ministries, a Tampa charity. Metropolitan Ministries provides care for the homeless in the Tampa Bay area and those at risk of becoming homeless through services that alleviate suffering, promote dignity, and instill self-sufficiency. The organization offers a number of services to ease hunger, prevent homelessness, and provide assistance for enabling self-sufficiency and transitioning back into the community. During the November and December holiday season, Metropolitan Ministries goes into overdrive and sets up its Holiday Tent, which serves over 18,000 families with food, toys, and other needed items, and recruits the help of more than 10,000 volunteers. 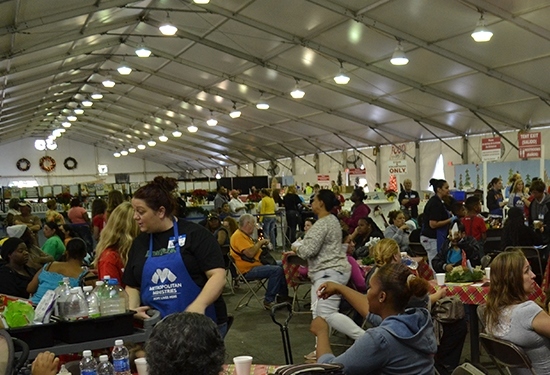 Inside the Metropolitan Ministries Holiday Tent. Thirteen colleagues, including members from our Marketing, Corporate Relations and IT departments. This is the sixth year in a row that we’ve organized this multi-group team, and we typically are able to assemble a team of 10 to 15 members each year. Greeting guests and providing them with special food items, like turkeys, hams, or chickens, and bagging and placing these along with their grocery and gift items on to carts. Loading all food and gifts on wagons, and pulling these wagons across the parking lot to deliver the items to guests’ cars. Directing guests and volunteers to appropriate spaces in the parking lots as they arrived and departed. There are so many rewarding parts to this effort, but one of the biggest is simply being able to witness the happy, smiling faces of the guests when they’re able to select special gifts, like a donated bike, for their children. As volunteers, we’re able to share in the joy that these guests feel in knowing how much the community cares about them and their families, and in knowing that they will enjoy a wonderful meal at Christmas time with their loved ones, and this is truly unforgettable. Cissy Wong is a former Senior Director, Creative Marketing and Global Events, at Syniverse.